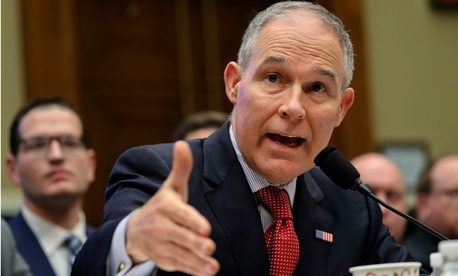 The embattled head of the Environmental Protection Agency was defensive and at times defiant during two hearings on Capitol Hill on Thursday, his first appearances before Congress since the administrator has faced a barrage of allegations of questionable ethical behavior. The accusations amounted to “half truths” and “lies,” Scott Pruitt said in his testimony, blaming his opponents both inside the agency and in the media for advancing a narrative aimed at preventing him from enforcing his agenda at EPA. Pruitt acknowledged some of his activities led to potentially bad optics and promised to make changes if proper processes were not followed. In some cases, he said, he has already instituted changes, such as not flying first class. In other cases, he pointed the blame at EPA staff for approving practices without his knowledge or demurred by saying potentially problematic decisions were under review. The administrator conceded that he gave the “green light” for raises to his top aides, though he maintained that he had no knowledge of the amount or the arcane process through which they were awarded to circumvent White House concerns. That prompted Rep. Paul Tonko, D-N.Y., to criticize Pruitt for not having “any idea what is going on in your name” at the agency. Pruitt defended the security protocols instituted for his protection, saying the inspector general confirmed he was facing an unprecedented level of threats. Rep. Betty McCollum, D-Wash., said she spoke to the IG on Thursday and he disputed those claims. Pruitt provided the House appropriations panel with oversight of the EPA with a copy of an IG threat assessment citing threats he received on social media, though McCollum still doubted the administrator was honest in who issued the assessment and in qualifying the severity of the threats. Pruitt faced blistering attacks from Democrats throughout the day. She also criticized Pruitt for removing employees or pressuring them to resign for speaking out against his spending habits or on environmental issues that the Trump administration does not prioritize, saying he was hurting morale and forcing employees to fear retaliation. The administrator denied the allegations. “I’m not aware of any instance that any action has been taken for employment status with regard to those issues,” Pruitt said. McCollum responded by calling on Pruitt to resign. Republican criticism was significantly more tempered, with the most pointed comments amounting to statements that they could not defend his actions or that he would have to be held accountable for whatever results stem from the multitude of outstanding investigations into his behavior. Many Republican lawmakers actively defended Pruitt and blamed Democrats for engaging in a politically motivated witch hunt. “This has been a classic display of innuendo and McCarthyism,” said Rep. David McKinley, R-W.Va.
“It is shameful today this has turned into turned into a personal attack hearing,” said Rep. Bill Johnson, R-Ohio. After the appropriations hearing, Rep. Ken Calvert, R-Calif., who chairs the subcommittee, said he does not think Pruitt should resign but wanted to let the investigations unfold. “The committee is looking into these charges and we’ll have a resolution to it,” Calvert said. Rep. Tom Cole, R-Okla., praised his colleagues for “posing tough questions,” but noted the committee still is looking for answers on some issues.